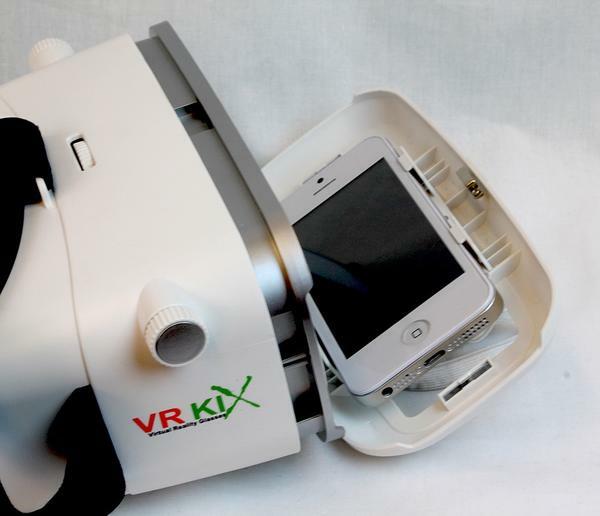 Turn your smartphone into a virtual reality machine with the VR KiX headset. These goggles feature an adjustable tray that securely holds your smartphone in place. Simply place the goggles, which have a padded cushion on the front for comfort, over your head, and you can view your phone’s display in 3D. The headset detects head motion, allowing you to control what you see by moving your head. Use these goggles to access a wide range of 3D content, including movies and games. There’s a large amount of 3D content on YouTube, accessible with any phone with an Internet browser. Netflix also offers 3D content, and the company plans to expand its library in the future. If you have an Android or iPhone device, you can download games and applications that offer 3D content through the Play Store or App Store, such as Angry Birds, Homerun Battle and Google Maps. For a more immersive gaming experience, you can sync a Bluetooth controller with your smartphone. The VR KiX headset is available as a stand-alone item for $49.99 with a charcoal, white or a custom finish, or as a bundle with a headset and Bluetooth controller for $72.99 with a white or charcoal finish.